Christian Gordon (red) scores for Peterborough Northern Star at ON Chenecks. Photo: Chantelle McDonald. @cmcdphotos. Holbeach earned a significant success in the United Counties League Premier Division title chase today (December 30). Seb Hayes’ side triumphed 2-0 at table-topping Newport Pagnell thanks to a goal in each half from leading scorer Lewis Leckie. Christian Gordon (second right) is mobbed by teammates after scoring for Peterborough Northern Star at ON Chenecks. Photo: Chantelle McDonald. @cmcdphotos. It was a fine win which meant the Tigers closed to within six points of their hosts. They also boast three matches in hand. Holbeach remain third in the table, but are now level with second-placed Wisbech – a team who thumped them 4-0 on Boxing Day. The Fenmen, who have two games in hand on Pagnell, saw their home clash against Cogenhoe postponed. A third local team now feature in the top six after Yaxley climbed to fifth place in the standings courtesy off a 7-0 drubbing of strugglers Sileby Rangers at In2itive Park. The Cuckoos continued their fine form under new manager Andy Furnell when recording the biggest win of his reign. Action from Peterborough Northern Star's win at ON Chenecks. Photo: Chantelle McDonald. @cmcdphotos. Dan Cotton hit a hat-trick, which included a penalty, with Jack Saunders, Tom Waumsley and substitute Teddy Haime (somewhat fortuitously as a Jack Butterworth shot looped in off his back) also on target. An own goal completed their haul. Yaxley are unbeaten in six league games since Furnell succeeded Brett Whaley as boss in late November. 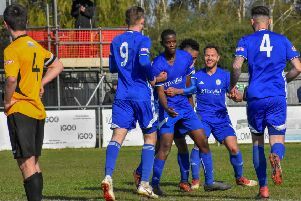 Deeping sit one point and two places behind Yaxley after being held to a goalless draw by Daventry Town at the Haydon Whitham Stadium. Peterborough Northern Star enjoyed a successful end to 2017 with a 2-1 victory at Northampton side ON Chenecks. The city side struck twice in the space of six second-half minutes thanks to Zak Munton and Christian Gordon. Connor Pilbeam was denied a third goal by a post before the home side halved their arrears, but Star held on to pocket the points. Table-topping Pinchbeck continued their surge towards the United Counties League Division One title with a smart away success. Ian Dunn’s men triumphed 3-0 at Potton to extend their unbeaten run to 13 league games. A dozen of them have ended in victory. New signing Aaron Eyett hit an early opener after being snapped up from Premier Division side Boston Town during the week. Ollie Matlby doubled the lead from the penalty spot just before half-time and Andrew Tidswell hit a late clincher. Blackstones and Bourne both saw home games – against Harrowby and Huntingdon respectively – postponed. March Town were beaten 2-0 at Norwich CBS in their final Thurlow Nunn League First Division outing of 2017. Struggling Wisbech St Mary’s home date against Leiston Reserves was postponed. Premier Division: Deeping Rangers 0, Daventry Town 0; Newport Pagnell Town 0, Holbeach United 2 (Leckie 2); Northampton ON Chenecks 1 Peterborough Northern Star 2 (Munton, Pilbeam); Yaxley 7 (Cotton 3, Waumsley, Saunders, Haime, og), Northampton Sileby Rangers 0. Postponed: Wisbech Town v Cogenhoe. Potton United 0 Pinchbeck United 3 (Eyett, Maltby, Tidswell). Division One: Norwich CBS 2 March Town United 0. Ppstponed: Wisbech St Mary v Leiston Res.